I work at Who's on First Sports Cards and write financial articles for MTGPrice.com; I've been playing MTG for fifteen-years, and have been professionally trading/selling cards for the last five. My favorite Vintage build is Goblin Foodchain; my favorite Legacy build is Aluren Storm; and my favorite Standard build is Naya Zoo. Last week I began writing the first part of this mini-trilogy which focuses on avoiding bad trade habits; my second installment in the series for MTGPrice.com focuses on the market of foil singles. If you’re truly hungry, like I am, you’ll take the time to sniff out your local market’s needs and cater to your peer players, make yourself part of the store, and make yourself well known. Your local market as a whole is comprised from a pool of other players whose needs and wants can vary drastically from each other; so how does one effectively assess the cards that are desirable within their MTG scene? There are a few approaches to doing so that I will further discuss. High Market. (c) 2013 Wizards of the Coast. Segmenting your market into different customer bases is quite simple once you understand how to do so. Begin by determining the largest demand within your store, and cater solely to that. This focus can range from promotional cards, to Elder Dragon Highlander (EDH) foils, to format staples for Vintage, Legacy, Modern, and Standard (the most common approach). Whatever the largest demand is at your LGS, find it and use it to your advantage. A niche that I’ve strongly profited from lately is the EDH foil market – not many players stock these cards, but just about every other player with an EDH deck wants something that I have in a binder. Foils, in general, are a bad niche to invest in – I would advise weekend traders and players to stray from acquiring a robust binder of foiled cards. Certain cards, however, are extremely profitable when compared to their non foiled counterparts, as well as other foils on the market. Below is a list of foiled EDH cards that I have traded or sold within the past few months, as well as their normal and foil prices, rounded to the nearest dollar, for the sake of contrast. There are many more foil cards that are heavily sought within the EDH market, and most are safe areas of investment. While money can be made in Modern and Standard foils, profit margins are small and detrimental volatility is high. 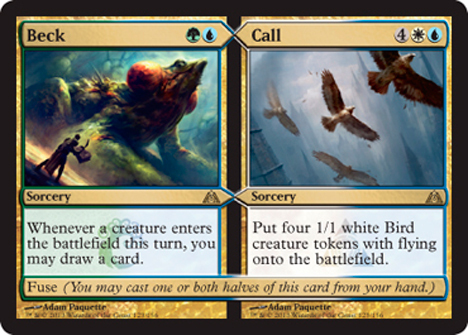 To briefly illustrate this point, let’s examine some of the most sought after cards from the new set, Gatecrash. When Aurelia, the Warleader hit the market nearly 2 months ago on Feb. 1st, the foil price was $49.99 on Starcitygames; today, the cost for a foil Aurelia from SCG is only $34.99 – a loss of 30%. Similarly, when Gideon, Champion of Justice was released on Feb. 1st, the foil cost $69.99 through SCG, but now only costs $21.99 from the same site – a staggering loss of nearly 70%! Cornering a portion of your local market is difficult without acquisition power; so, if you lack enough capital to obtain a stockpile of niche foil singles, a different approach may be better suited. An easy way to turn your extra cards into money is by simply asking other players what they are looking for. I know this sounds elementary, and it is; but chances are you actually have a card that somebody else wants to buy or trade for, and you have to inquire to find out. In the event that another player is looking for a card you don’t own, ask them what they value the card at; then go trade for it, and come back to cash out! 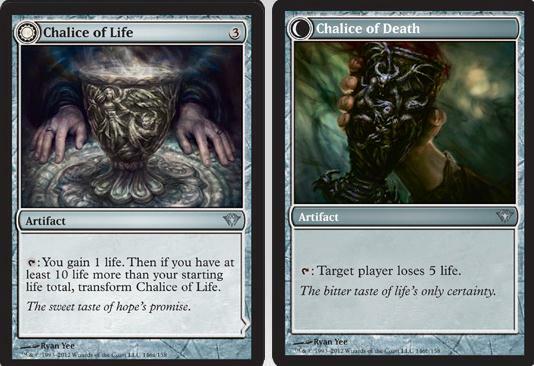 That’s all for now, make sure to check back next week for my final installment in this series: why not to trade eternal format staples for standard cards. P.S. Franny, this one’s for you brooo! 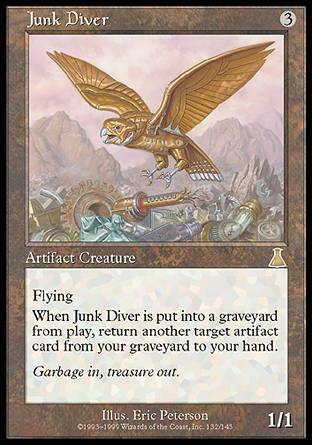 Junk Diver. (c) 2013 Wizards of the Coast. Across the web, you can locate many different columns and articles filled with endless salvos of financial advice regarding Magic the Gathering investment ploys and tactics. Amongst all of the fluff, however, is very little – if any – advice about what not do to and how to avoid being burned by bad investment maneuvers. Surely I could put my trade-formula on paper for you to take note of and apply, but I’ve no interest in sharing my homework (at least not for free). However, I am much more willing to share the investment practices that I avoid making; as opposed to the trade-secrets that have continued to feed me. Beginning with this week, I will write a 3 part mini-series about avoiding bad trade habits. Let’s jump right into things and discuss why you should avoid the first bad tactic of buying bulk lots. 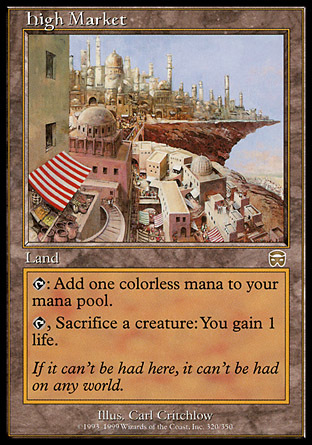 In general, bulk lots are a great starting point for new players – but that’s where the most value exists: amongst players without large pools of cards to select from; players who’ve been collecting for years tend to have a versatile assortment of readily playable cards, with no need to purchase a bulk lot. Assume I purchase a lot of 200,000 cards for $5,000.00, and want to resell them; the average LGS’s boxes of singles are priced: $0.10 per common, and $0.25-0.50 per uncommon; if I bought 200,000 cards for $5,000.00, I would pay $0.025 per card. Now, if I could sell each card for $.05 (half of the average common price) then I would make $10,000.00 – a return on investment of 200%! But wait, that’s a horrible plan; even if I stand to double my money, I have to consider the amount of time and energy I would need to spend in order to look through the cards – as I assume there are some worth $1-$5 in the bunch, and want to ensure I’m not losing any money when selling them for 0.05 each. Moreso than the effort I must exert to rummage through a fifth of a million cards, I have to worry about the amount of time it will take me to sell these cards; if I manage to sell 10 cards to each person who purchases from me, I still need a total of 20,000 sales before they are all gone – seeing the bigger picture? Good, because my time is valuable, and I hope that you believe yours is as well. It’s my experience in the long run, that buying bulk lots is a bad investment habit; this doesn’t mean that money can’t be made from bulk lots, but rather that re-selling bulk lots is a bad plan for profit. If you find yourself sitting on plenty of spare commons and uncommons that you’ve multiple playsets of, or never intend on using in decks, then it’s time to make some extra gas and lunch money – here’s how (ok fine, I’m sharing a small personal tactic): organize your extras by rarity first (commons & uncommon), then organize them by color, and then finally organize them by format (vintage, legacy, modern, standard); buy a few 500 count and 1000 count boxes; fill a box of cards with uniform rarity, color, and format – then mark it for sale (1000 Standard Red Commons for $20). I charge $10 per 500 commons, and $10 per 100 uncommons. These bulk boxes bring in steady money for me, and clear my storage space – I can’t complain one bit. If you catch the scent of a bad investment model, don’t bite down; instead, evaluate how to apply relative business principles within your frame of access, in order to maximize inventory turnover and ultimately, to ‘freshen the scent’ for customers. Well how exactly do you go about ‘freshening’ the appeal of bulk lots? Simple – don’t pick out every card with relative value: nobody wants to purchase bulk Grizzly Bears and Stone Rain with assorted basic core land. 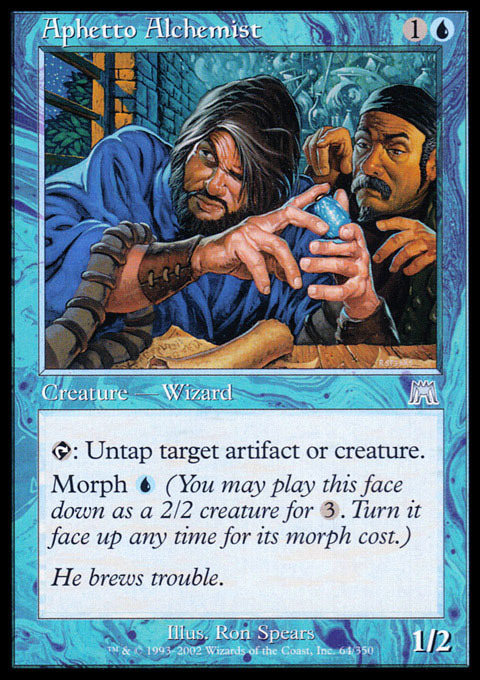 I’m not advising that you spice up your bulk boxes with Sensei’s Divining Top or Remand, but, small things like Mana Leak, Rampant Growth, Shock, Terror, and Holy Day are dirt cheap and appealing to casual players. For the record, ‘casual player’ is not synonymous for ‘drooling troglodyte’ – if you want somebody to bite on your offer, make it smell better: stacking garbage onto a garbage heap adds zero definition and increases the stench. This will conclude my weekly entry for MTGPrice.com. I thank you for reading, and hope that you’ll return next week to check out the 2nd article of this series!